Home > What is difference between SD540 and SD540B? SD540 implements a safety feature to disable operation when battery voltage drops below 9.5 volts. This feature is designed to prevent battery from depleting excessively (which would cause damage to your battery). Note however that, this safety feature does not activate in case of short spikes in battery voltage, (in other words, motor performance is not affected by spikes, which are caused when other loads turn on). SD540B model does not include this feature. SD540B will work down to 6.0 volts without disabling any of its operations. 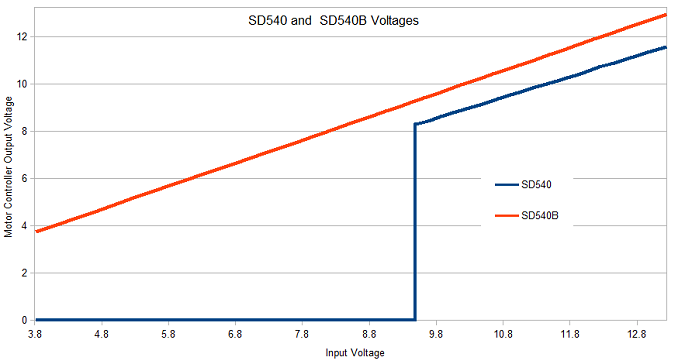 Also SD540B has firmware updates that can deliver more power than SD540. How SD540, SD540B, Spark and Talon compare?? You can order SD540B here.